Today I pledge my love to thee! Many people fear throwing a beach wedding because they think the location will hinder their ability to decorate and gain that wow-factor. While your ceremony and reception may not be indoors where you can utilize a ceiling and wall space, there are certainly plenty of great ways that you can dress up your wedding. 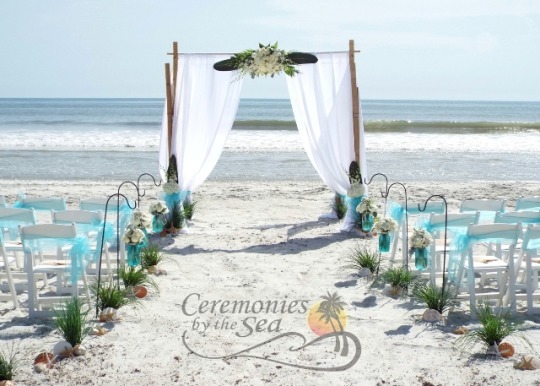 At Ceremonies by the Sea, we can create something special for your beach wedding, at a price that we’re sure you can live with. 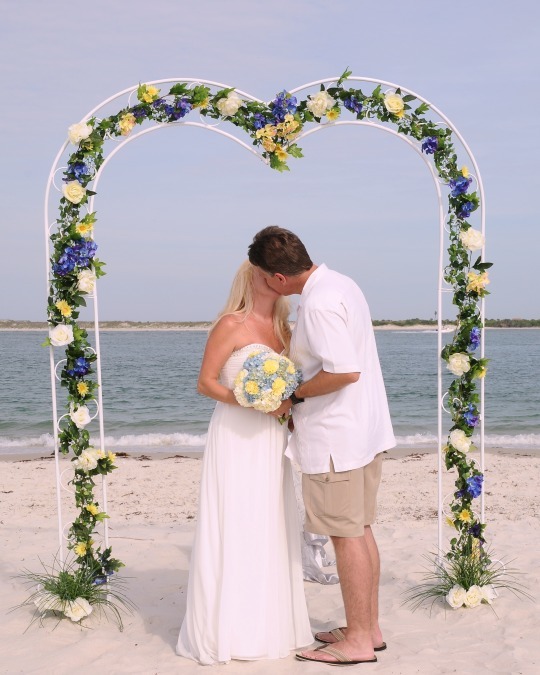 Starting off with the ceremony, why not consider a flower-covered arch? We could create a simple yet beautiful backdrop as you say your “I Do's”. When it comes to seating, light-weight organza chair sashes around the back of the chairs can really dress it up a bit. We can even attach a big starfish piece to the center of the sashes, just to stay with the theme of the beach. When it comes time to let your hair down and move on to the reception, we’ve got a few ideas that surely will not leave you lacking in that wow-factor department. First of all, let’s get your guests to the right table; grab yourself some pretty sea shells, and write the name of each guest with the table number he or she is assigned to on the inside of the shell. Your guests will be impressed with your creativity and it’s a much cheaper alternative to having small name cards printed out for every single person at your wedding. Now, one of the main concerns couples have about beach weddings is that once the sun goes down, your light is gone. Wedding receptions are fun and usually go on well into the night, so you don’t want to cut your party short just because of lack of light. Tiki torches are a great option at the beach, and also stay true to the tropical theme. Or if you do have access to power, perhaps sticking a number of large poles into the sand as anchors, and stringing a series of twinkle lights above the tables where your guests will be eating. Not only does that leave you ready to make the night last longer, but it also offers a very romantic and intimate ambiance. We know that it’s strange to think that you could decorate to make a beach wedding seem more “beachy”, but you really notice the difference once it all comes together. For more ideas for your beach wedding, visit our website and check out all of the great options provided. 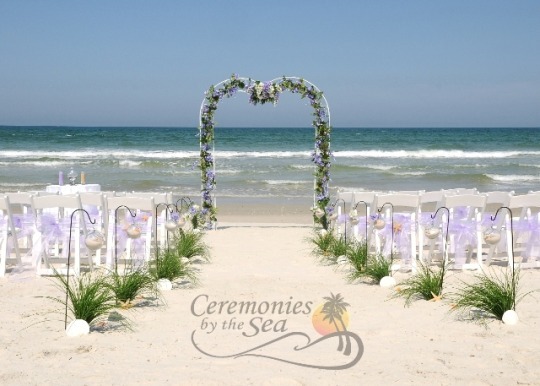 Once you’re ready to start making this happen, give Ceremonies by the Sea a call! So he proposed and you said “yes!” But that is just the beginning. Now it is time to plan your big day. One of the first things you should consider is the theme of your wedding that everything else will surround. What better way to begin your journey than by the sea? Begin your happily ever after at a beachfront oasis. Here is some advice on how to make your nuptials as enchanting as the coastal escape. Dress Accordingly - Choose the venue, before choosing your attire! If you are choosing to exchange vows on the shoreline, it is important to dress accordingly. Destination weddings often include unexpected weather; calm or brisk breezes, sweltering or mild heat and of course a lot of sand. You should consider skipping a big ball-gown, even for your bridesmaids. Walking a long the beach and the water will be a daunting task for all of the bridal party if they are carrying around excess, unnecessary fabric. Choosing a gown with light fabric, such as chiffon, allows the fabric to flow freely, refraining from picking up any unwanted debris. You might also consider a tea-length dress. This still maintains a formal look but allows for easy movement along the shore. Protect your Skin - Tan lines and sunburns are the worst! It is very important to use sunscreen prior to the day of your wedding. There is nothing worse (well maybe a few things,) than unwanted tan lines or a painful sunburn. To avoid this mishap, continuously apply waterproof sunscreen and advise your bridal party to wear strapless bathing suits. Know the Requirements - Find out local rules or restrictions. Have a Back-up Plan - Hope for the best; plan for the worst. Because weather can be unpredictable, it is important to have a Plan B. If you are adamant about hosting the ceremony on the shore, be sure to have a tent to cover your guests that can also withstand the wind and rain. You can also choose to have a venue that has an indoor option, in case the weather is less than perfect for your big day. Don’t worry about the weather ruining the beach theme. The sun, sand and seashells can easily be translated into the indoors through decorations, accents and even real sand from the outdoors! As more and more beach weddings are being featured in movies and on the covers of bridal magazines everywhere, couples all over the world are considering this location more frequently when it comes to planning their wedding. However, fear that the ceremony won’t go as we’ve always pictured it has left many couples closing the door on that option and deciding to go with something indoors. While this is perfectly fine if an indoor wedding is what you truly want, we wouldn’t want you to turn your back on something you really want just because of nerves. 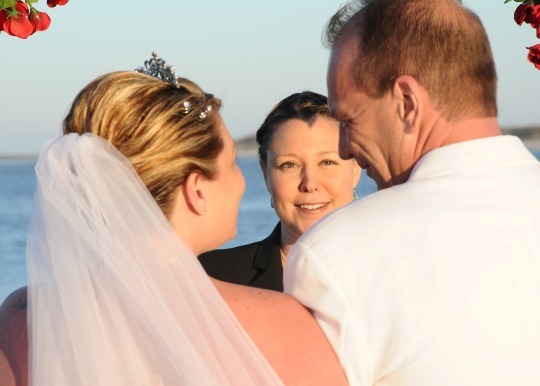 At Ceremonies by the Sea, we’ve been a part of the wedding world for quite some time now and it seems like we hear the same excuses every time. What’s really disappointing about this is the fact that a lot of your reasons for opting out of a beach wedding are actually myths, which is why we wanted to take this time to shed some truth on the matter. Click Below for Common Myths about Beach Weddings! Myth # 1: It’s going to be WAY too hot – While we can’t account for everyone’s natural body temperature, for the most part, this is a myth. Because the most popular time to get married is during the warm summer months, we can see how this might be a concern. However, keep in mind that beaches include water and a nice breeze from the crashing waves. Just to be on the safe side though, consider sheltering your guests in a sheer overhead cloth that will still maintain the light, island theme but absorb some of that blazing sunlight. If you’re not interested in that, you may also want to look into offering bottled water, hand-fans or small umbrellas to guests as they arrive. Myth # 2: Everything has to be casual – It’s your wedding, which means that you can do whatever you want to. Just because you want to say your vows outdoors and next to the water does not mean that you have to wear a sundress or that your husband-to-be has to wear shorts. While these are both terrific options, go with a full length gown if that’s what you’ve always dreamed of wearing on your wedding day. It’s entirely up to you to decide how formal or informal you want this day to be. Myth #3: Pictures will be ruined by the locals – If you’re planning to have your ceremony on a local beach, you can’t exactly ask all of the locals to refrain from visiting the shore on that day. However, you should know that most beach-patrons who see a wedding ceremony going on will respect your space and the importance of your day. Additionally, you’ll probably find that most beaches have areas that are more secluded than others. Visit your local beaches during the planning stages of your wedding and scope out some of the more private areas. Overall, your wedding day will be a dream come true no matter what, so you shouldn’t stress about the small things – especially when you don’t have all of the facts. If you have questions about what a beach wedding entails, don’t be afraid to ask – we’re here to help! Brittany & Randy were married today at Winter Haven Park in Ponce Inlet, FL. It was a chilly (for Florida), yet beautiful day! With so many lavish celebrity weddings being held all across the globe, it’s tough not to be a little bit envious when it comes time to plan your own. As much as we may admire the extravagance of it all, when it all comes down to it, the majority of us simply can’t afford a wedding ceremony quite like the stars can. Well most of them that is. While some celebrity couples choose to say their vows in impressive cathedrals and extraordinary venues, others opt to keep things on the simpler side of the spectrum. Celeb duos such as Tori Spelling & Dean McDermott, Cindy Crawford & Rande Gerber, Alicia Keys & Swizz Beatz, and Nick Lachey & Vanessa Minnillo, have all chosen a beach wedding over an indoor venue on their own special day. Regardless of their A-list standing and the amount of money that each of these stars manages to bring in each year, it’s easy to tell why they may have decided to go with the obvious option of luxury. Beach weddings are simple; while you can dress up your ceremony as much as you’d like, using flowers, lights and a number of other decorative pieces, you’re still outside, toes in the sand with the sound of waves crashing in the background. While the idea of a church or other place of worship may be appealing to some, others (like the previously-mentioned A-listers) prefer the idea of a free, open area that still manages to feel intimate. While some celebrity beach weddings may still border on extravagance, there are plenty of ways to make your own beach wedding just as beautiful. Call Ceremonies by the Sea today; we have plenty of expertise when it comes to adding to the atmosphere of beach weddings, and we’d be more than happy to help you come up with a look worthy of the stars. Herb and Linda met in Drama Club at Stoughton High School and started dating when she was a freshman, in 1963. They dated throughout High School and were basically inseparable. Herb always wanted the best for Linda, including her being able to continue her education. Having lost his scholarships and the possibility of a military career due to a football injury, he felt he could not care for her or support her in the manner he felt she deserved. So he abruptly broke up with her, telling her he was getting married and leaving the state. He DID leave, but he had no plans of marriage to anyone at the time. Linda went on to pursue her nursing education, joined the Army and moved to Florida, where she eventually became Director of Nursing Education at a local hospital. She married twice, but had no children. Herb got degrees in both Mechanical and Electrical Engineering, married 3 times and had 3 children, but always felt there was something missing in his life. He always carried a heavy heart for the way he broke it off with Linda and was determined to find her again. 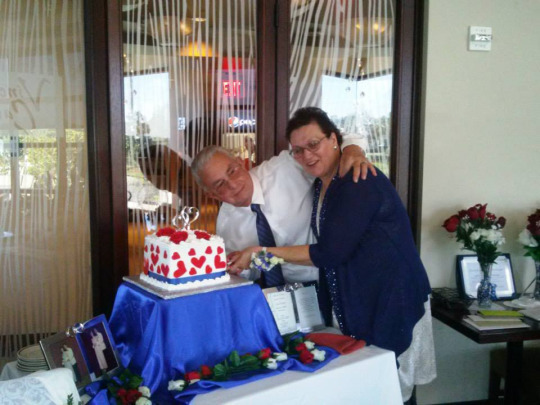 Herb finally found Linda in 2013, after searching for her for 45 years. It was only then that he realized he had been living all those years with a broken heart. Now, AT LAST, they each got to marry the love of their lives. 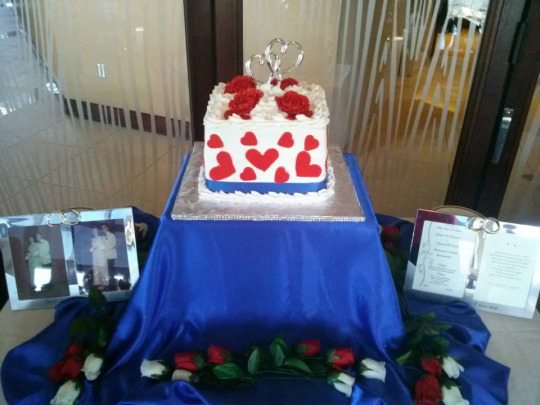 Linda & Herb were married at Vince Carter’s Restaurant in Daytona Beach, Cake by Heavenly Cheesecakes, and Flowers by Simply Roses. Ceremonies by the Sea would like to congratulate all the newly engaged couples this season! If you want to plan your perfect destination wedding, give us a call so we can help you create memories to last a lifetime! If you’re engaged and in the midst of wedding planning, first of all, congratulations! Your wedding day is an occasion that you dream of your entire life, and it can be very surreal when the time actually comes. While many couples think of all of the pieces to a wedding puzzle, the first things that come to mind are the dress, the cake, the rings and the food. However, one of the key elements may just mistakenly slip your mind: who is going to marry you? It’s very important to realize that who you choose to officiate your wedding can make all the difference in the world. You may just view an officiant as someone who says a few words and has the authority to pronounce you and your love “husband and wife” but in reality, there are many more advantages to working with a good wedding officiant. Expertise – If this is your first marriage, there are going to be a few things about the ceremony that you aren’t familiar with. A quality wedding officiant will be able to walk you through the whole process and answer any questions that you may have. 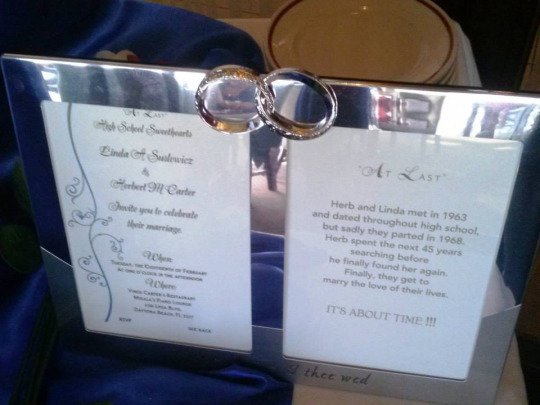 They’ll even be flexible enough to work with you and customize your ceremony to your preferences. 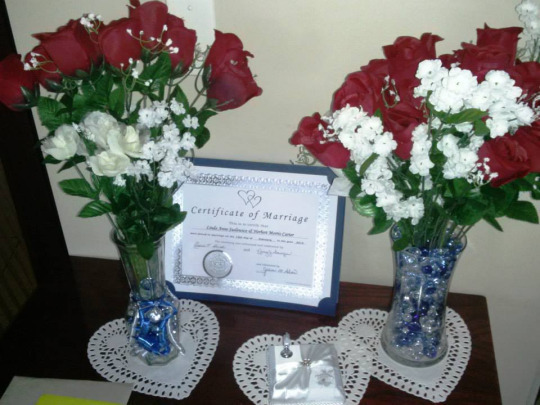 A Second Voice – Are you and your future spouse considering writing your own vows? If so, a wedding officiant can help. Sometimes it can be difficult to find the right words to express how you truly feel about the person that you love. 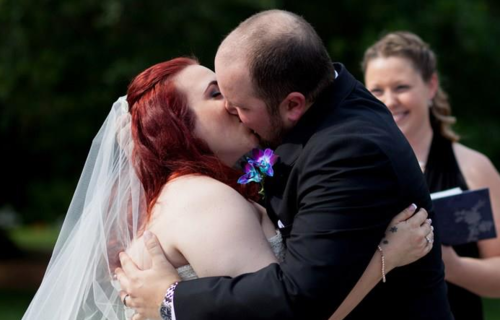 As a major part of the ceremony, your officiant has seen and heard a lot. Use her to your advantage and bounce a few ideas her way until you find the words that are right for you. Ceremonies are Their Specialty – If you’re having a large wedding, you’ve likely asked a wedding planner to help you put everything together. Now the thing about larger weddings is the fact that there is an unbelievable amount of things to do to make sure everything goes off without a hitch. While the reception is where all the fun is, the ceremony is what makes everything possible; having an extra set of hands and eyes can make sure that the moment you say “I do” is as perfect as you’ve always imagined it. 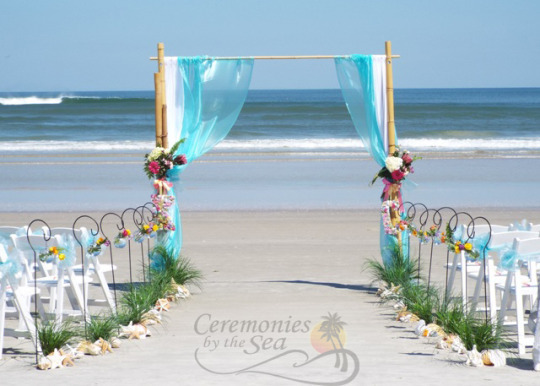 For more information on hiring a professional wedding officiant near New Smyrna Beach, FL and to learn more about what can be done for you on your special day, contact Ceremonies by the Sea today. We’d be honored to help bring everything together!